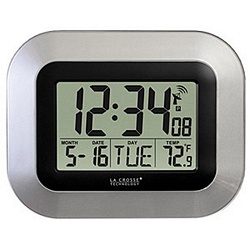 This digital clock displays the time on a large LCD and also features the month and day, indoor temperature, and alarm clock. Hang it on the wall or use the stand to place it on your desk. Requires 2 AA batteries. Radio-controlled (or "atomic") clocks set themselves automatically by tapping into the time signal broadcast from the cesium fountain clock located in Boulder, Colorado. Accurate to 1 second every 80 million years, the atomic clock signal is broadcast over North America by the National Institute of Standards and Technology. Please note, radio-controlled clocks may have difficulty finding the NIST signal in Alaska, Maine and parts of Canada. Pros: When it works, it does a good job. Looks nice. Cons: When received, the WWVB reception did not work. Internal construction is really shabby, to the point of causing failure. Tiny wires, poorly soldered. Bad quality control. Other Thoughts: I actually bought the black trim version of this clock, but I had the same problem as another reviewer had.. the clock would not detect WWVB, so I decided to put my review here, with the silver trim version, so potential buyers could see my approach to solving the issue. I believe the two clock versions are identical electrically. Before returning the unit for exchange, I thought I would see if the problem was easy to fix, and I removed the back cover. I found that the heavy ferrite antenna had come loose and broken one wire. It is supposed to be attached to the cover by hot-melt glue at the factory, but they did a bad job and the glue did not stick to the cover so the ferrite broke free. I re-attached it with my own hot-melt glue, and re-soldered the wires to the little WWVB receiver board. If any of you decide to try this, the antenna wires go to the two leads of the green mylar film capacitor that sticks up from the WWVB board. Fixed the problem, works OK.
6 out of 6 find this review helpful. Pros: Keeps excellent time once it works-Cyberguys.com are great to work with! Cons: Very poor quality control by manufacturer. Other Thoughts: I received the clock and inserted batteries. All worked well except it would not detect WWVB signal. It tried but no luck. I replaced the batteries twice more but to no avail. I called Cyberguys.com and they said they would send me another and to throw the first one away. While waiting for the replacemennt, I opened the clock and immediately saw that a wire was hanging loose. Also, the ferrite antenna had broken loose during transit. I could not determine where the broken wire was supposed to be connected. I received the replacement clock and inserted the batteries. NO DISPLAY! Replaced the batteries but still no readout! What the heck? I opened it up and saw that the ground wire from the batteries had come unsoldered. I soldered it back (VERY DELICATE), inserted the batteries and it worked. While it was open, I found where the antenna wire that had come loose on the first clock was supposed to connect. I repaired it and it now works! Whew! LaCrosse needs to improve their QC! 9 out of 9 find this review helpful.